Nicholas’s mom sent Lemonade Day a note of thanks. I just had to share their story. 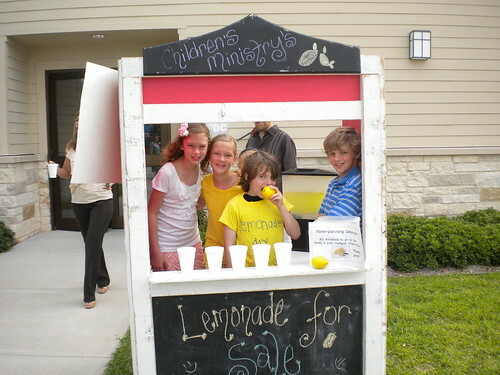 In 2010, Nicholas did a neighborhood lemonade stand and liked the idea (It was fun and profitable!) At that time, we had a conversation with him about if he did it again, he should consider donating the money to a good cause. Not too long after that we were at the Houston Zoo where they were signing people up for Lemonade Day 2010. He wanted to sign up. We suggested to him that he approach our church to see if he could do it there and donate the money to the church. He was eight at the time. (Lemonade Day was actually on his birthday!) We did pave the way but had him set up a time to meet with our Children’s Minister to discuss the details and logistics. Using the materials Lemonade Day provided, he came up with a list of questions and points for discussion for this meeting and came up with a plan to get the other youth involved. They also decided together how the money could best be used. He wrote a paragraph for the church newsletter, created sign-up sheets and talked about it during Sunday School in order to recruit other kids. He got a great response! The kids all had a blast and they raised just under $200 dollars that was used to purchase supplies for Vacation Bible School. I was really proud of him for making that choice! By donating it to VBS, he got his name on the back of the shirt which was very cool for him but was never even a consideration in his mind. There was no doubt in his mind that he wanted to participate in Lemonade Day 2011. In February, our church family lost a wonderful woman, who was the mother of two young children, to breast cancer. The church established a trust fund for the children. This year, Nicholas knew immediately he wanted the Lemonade Day money to go to the children’s trust fund. Once again, we worked with the Children’s Minister. She has been so supportive! Based on the fun and success of last year, we had no trouble getting the other children involved again. They helped make posters to advertise and signed up for shifts to help sell. This year the stand tripled its profits! Through the wonderful support of the congregation the Lemonade Stand raised $621.12 for the Children’s Fund! (All supplies were in-kind donations so all money raised goes straight to the cause!) He presented the check to the family this past Sunday during the service. It was a powerful experience. One of the things Nicholas mentioned learning after this year’s experience is that he is happy to be behind the scenes. He likes the creative planning part and the process of coordinating others. Then, he is perfectly happy and more comfortable to let others get out front and sell while he works in the background. We are hoping that each year Nicholas will grow a little more and do a little more. As I mentioned last summer, he has some real social difficulties due to a neurological difference he has. I worry about him a lot! Being so shy and anxious it is such a great leadership opportunity for him and all the kids just love it! Thank you to your organization for providing him with this opportunity. Experiences like this are so amazing for him and give me so much hope! In my short 5 months with Lemonade Day I have probably heard 50 stories. I’m continually inspired by our youth’s generosity and resilience. And it’s my hope that this program can give youth who may be struggling in life like Nicholas the tools they need to be more successful, as well as transform our future as a country. Thank you for sharing your story with me, Laura. Entry filed under: Lemonade Stories.